For 70 years, Waterloo Region Home Builders’ Association has been a strong advocate for the home building industry and is recognized as the voice of the residential land development, home building and professional renovation industry in Waterloo Region since 1946. Membership in Waterloo Region Home Builders’ Association is a mark of distinction which identifies the company as an industry professional. WRHBA represents over 210 member representatives comprised of the residential construction industry. With membership in our local association, members also benefit from membership in the Ontario Home Builders’ Association (OHBA) and the Canadian Home Builders’ Association (CHBA). Together our voice at the municipal, provincial, and federal level is very strong. Representatives at all three levels of the association interact regularly with elected officials and bureaucrats ensuring that when decisions are made, those making them are informed. WRHBA actively participates through a number of municipal liaison committees organized to represent the interests of the Association related to building and development issues within our region. WRHBA also coordinates its advocacy efforts with CHBA, OHBA and other Home Builders’ Associations. Monthly reports are provided to members through a newsletter entitled “Advocacy in Action”. Across our region, consumers, business people and elected officials recognize WRHBA’s logo as the sign of professionals. Members let people know that their company has the knowledge, experience, and commitment it takes to succeed in this industry. Members are encouraged to use WRHBA’s logo in marketing materials as a sign of their commitment and professionalism. Regular communication provides an excellent opportunity to stay in touch with the industry issues. Breaking news is rapidly disseminated to members. WRHBA produces a near bi-weekly eNEWS email publication to ensure members are up-to-date with all industry information and includes a business news portion at the monthly dinner meetings. WRHBA members meet eight times a year at Golf’s Steak House and Seafood Restaurant in Kitchener. These monthly meetings provide an excellent opportunity for members to come together to network and to be kept informed on the latest issues affecting the industry. On average, over 120 members attend these meetings to hear a variety of keynote speakers. One of the most celebrated reasons for membership is the networking possibilities afforded to members. Opportunities to stay in touch with clients, peers, and the development of new relationships while growing your business are available through a multitude of activities including 6 major events and 8 dinner meetings. RenoMarkTM is the renovators mark of excellence. Renovators that become a part of this program are committing to a higher standard. RenomarkTM renovators believe in professionalism, have legitimate business licenses, offer a warranty, take care of details and much more! WRHBA offers member to member savings which can ultimately pay for an entire annual membership fee! 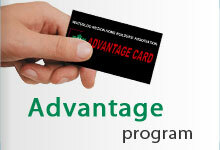 The Advantage card entitles member to special offers and discounts with participating Advantage Program partners. These savings and discounts are extended to member companies, employees, new home buyers and model homes.